Elias Zapple was not born in 1922, as some would have you believe. His date of birth is not really relevant anyway. What is relevant is that he arose out of a tulip that was growing in some old granny's garden in Camberwell. How he got to be in a tulip is not really clear, nor is it clear how he got out of the tulip, and years later wrote the smash hit musical, 'Love, be a Stranger', which was an international flop. After that success, he went on to work as a 19th century Victorian chimney sweep, when he was inspired to write the acclaimed series of books entitled 'Duke & Michel'. It is believed the fumes from the chimneys did so much damage to Elias, that it was a miracle he ever ate a cupcake again. Later, he travelled back in time to the present, and went on a series of trips to many foreign and distant lands. During these travels, Elias met and listened to many interesting people, choosing to ignore all of them. He did, however, learn a couple of things: i) the earth is flat; and ii) you should never eat a banana when it's not ripe. Many questions are often asked by his adoring public. Are you human? How many chimpanzees can fit inside a fridge? What is that thing growing on the side of your head? To which Mr Zapple has always smiled, turned away and swam off into the sunset; having only once been bitten by an unfriendly shark. Elias Zapple continues to work towards the unification of Korea, and writing children's stories that parents will spend huge sums of money on. He wishes you all to know that every penny made from the books will go straight into his bank account, which he will then spend on a lavish, new tent. 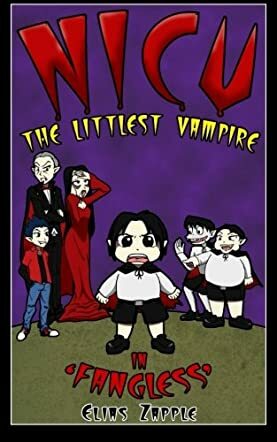 Nicu - The Littlest Vampire: Fangless (Nicu - The Littlest Vampire Series Book 1) by Elias Zapple is a spooky story with a good message for children. Nicu is a fangless vampire and lives in a house in the Carpathian mountains of Transylvania. He is always made fun of by his family and he wants to get his fangs back by any means so that he can silence all those who laugh at him. Even the dentist is not able to help nine-year-old Nicu. He meets the Fang Fairy and then things change. Will Nicu get fangs and be like other vampires? It is an entertaining story for children which has humor and a good message rolled into one. The plot is original, spooky, humorous and crazy and will keep young readers glued to it. Nicu is the vampire everyone will end up loving. He is cute, he is adorable, and he is determined. The black and white sketches complement the plot and breathe life into the characters. The style of writing is simple, descriptive and detailed. The author succeeds in getting across moral and ethical messages to readers and handles the topic of bullying refreshingly well. The hilarious moments, memorable characters, and incidents in the plot make the story fast paced and fluid. Bullying is a topic that all of us need to be aware of and the author raises awareness about the topic through Nicu's story. It is definitely a must-read for all children.